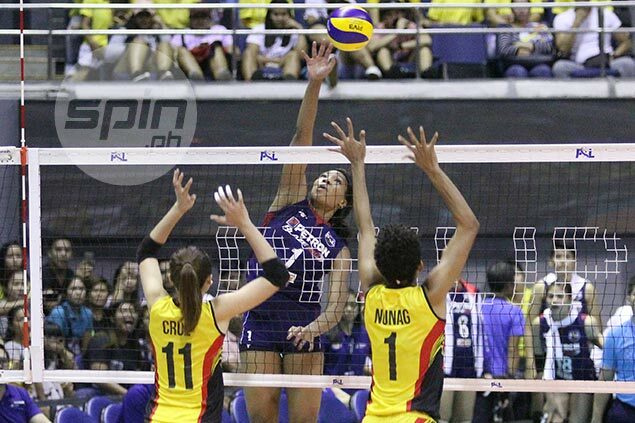 PETRON fought back from two sets down to stun defending champion F2 Logistics, 23-25, 20-25, 25-15, 25-22, 15-9, and move a win closer to claiming the Philippine Super Liga Grand Prix crown on Tuesday at the Araneta Coliseum. Kat Bell finished with 42 points, scattered from 36 attacks, two blocks and four service aces, while skipper Lindsay Stalzer sparked on both offense and defense with 17 markers, 19 digs and 16 excellent receptions as they bailed out the Blaze Spikers, taking over late in the fifth set to complete the comeback from a sluggish start. Petron also found ample support from the local crew, particularly from Aiza Maizo-Pontillas who scored crucial points in the fifth set. Last year's runner-up can complete its bid to exact payback with a win in Game Two of the best-of-three series on Thursday. Venezuelan import Maria Jose Perez and American reinforcement Kennedy Bryan finished with 16 and 15 points, respectively, for F2 Logistics.